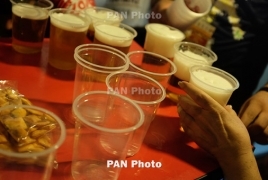 PanARMENIAN.Net - Going teetotal is the only way to avoid risking health with alcohol, scientists have claimed. A major global study has concluded there is no safe limit to alcohol consumption. Previous research suggested that moderate levels of alcohol – around one drink a day for women and two for men – may protect against heart disease. But the authors of the new study insist that any benefits from drinking alcohol are outweighed by the harms. They estimate that consuming just one drink per day increases the risk of developing one of 23 alcohol-related health problems by 0.5%, compared with not drinking at all. US lead researcher Dr Max Griswold, from the Institute for Health Metrics and Evaluation at the University of Washington, said: “Previous studies have found a protective effect of alcohol on some conditions, but we found that the combined health risks associated with alcohol increase with any amount of alcohol. “In particular, the strong association between alcohol consumption and the risk of cancer, injuries, and infectious diseases offset the protective effects for ischaemic heart disease in women in our study. A standard alcohol drink was defined as one containing 10 grams of alcohol. Globally, around one in three people – or 2.4 billion – drink alcohol, said the researchers, whose findings are reported in The Lancet medical journal. Each year, 2.2% of women and 6.8% of men die from alcohol-related health problems including cancer, tuberculosis and liver disease. However among people aged 15 to 49 it was the most important risk factor, accounting for 3.8 of women’s and 12.2% of men’s deaths.